Diane Solway produced The Art of Politics for the November Issue of W Magazine. In collaboration with For Freedoms, an artist run super PAC, the features includes 15 campaign advertisements created by artists. 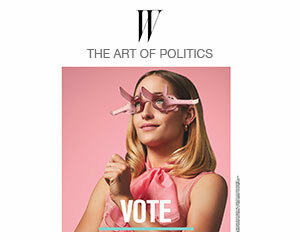 Zoë Buckman and Hank Willis Thomas’ collaborative contribution to the project is a poster that features actress, artist, and activist Jemima Kirke wearing speculum glasses with the words “VOTE JEMIMA – A New Vision For the Future” sprawled across the decidedly pink-hued page. Check out a PDF of the spread here. The artists went one step further in their involvement by also collaborating on an written piece for W Magazine explaining why they nominated their own fictional candidate in an article titled Vote Jemima! Artists Hank Willis Thomas and Zoë Buckman On Their Choice.